All transactions are safe and secure with a reliable history in online sales behind each of our associates. 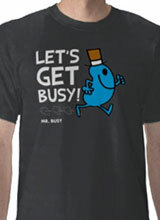 Buy Mr. Men t-shirts and clothing like the Mr. 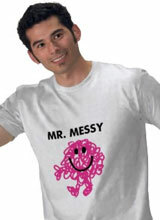 Perfect, Bump, Happy, Messy, Mr. Grumpy t-shirt and Mr. Strong tees. 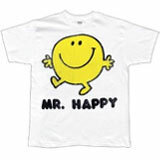 In 1971, author and illustrator Roger Hargreaves published a children's book called Mr. Tickle that he had written for his son Adam. 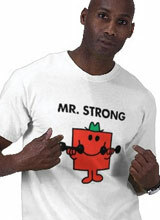 This ended up being the first of over forty Mr. Men books featuring simple but endearing characters that eventually made him famous. 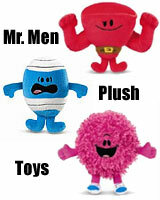 After Roger's sudden death in 1988, his son began adding to the collections including the Little Miss series. 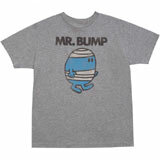 Remember their work with our gallery of Mr. Men t-shirts and merchandise including the Mr. Bump shirt, Mr. 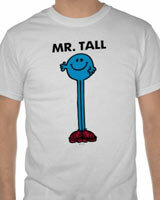 Perfect tee, Mr. 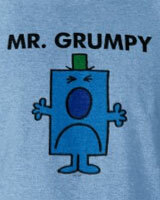 Happy, Strong, and Mr. Grumpy t-shirt. 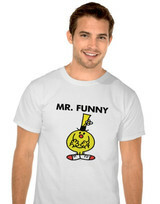 Get them for yourself and pair them off with a Hargreaves book or a stuffed Mr. Men plush toy figure.